Disclaimer: this is not a paid advertisement review. This is a product that I am personally using for my own weight loss goals. Last October, I had my second child and within a month, most of the “baby” weight came off. Out of the 28 pounds I gained, I lost 23 pounds. They say having a baby is the “best” diet as you lose so much weight so quickly. But the last 5 pounds I struggled losing, mainly because my sleep patterns were off, my diet wasn’t the best it could be and I hadn’t yet found my rhythm of balancing 2 children, running a business, a household and this blog – let alone find time to exercise those 5 pounds away. I had started my pregnancy 12 pounds over my “heaviest” weight and 25 pounds over the weight I feel best at. So put it all together, I felt I had 30 pounds to lose to feel my best. I had been good friends with a trainer for about 6 years and I knew she was a distributor of Advocare – and had previously suggested I try the 24 day challenge way before I was pregnant. My boyfriend had gained pregnancy weight too, so we decided together it was time to change things – we both wanted to get back to the way we were and started the 24 day challenge together. I had read many reviews online – some stated the program worked, some stated they didn’t lose any weight, some seemed too good to be true. I spent many nights looking up information because I wanted to be an informed consumer – after all, the 24 Day Challenge isn’t cheap – I wanted to make sure I wasn’t throwing money away that we couldn’t afford. I am only starting Day 11 of the challenge today, but I wanted to give an honest review of the Cleanse portion (Days 1-10) of the program. In 10 days, I lost a total of 6.5 pounds and my boyfriend lost a total of 13.5 pounds. Was it easy? No, it wasn’t. But when you see weight loss numbers like that, the restrictions and the cleanse was worth it. Now, here’s how the program works. So what exactly did my day consist of on the cleanse? Spark drink 30 minutes before breakfast (your caffeine plus vitamins and minerals that boost both mental and physical health). I used the fruit punch flavor and I didn’t crave my morning cup of Joe each morning. On Days 1-3 and again on days 8-10, Fiber drink just before my first meal. I had the citrus flavor. I admit the first 3 days were the worst as I found it overly sweet. I downed it quickly through a straw and and chugged 2 glasses of water to wash it down. By day 10, I didn’t mind the flavor and it didn’t taste as sweet. On days 4-10 probiotics. Taken 30 min before breakfast. These are the little white pills which are good for your intestines and stomach. If the bacteria is out of whack in your body, you may not lose weight. These help put your system back into balance. Breakfast consisted of 2 eggs sunnyside up with a side of peppers and onions most days. I also tried a veggie burger with a sunnyside up egg on top a few days. After drinking that fiber drink, you’re so full, you really don’t want breakfast. A mid-morning snack, usually a lean protein (chicken or turkey with a few slices of apple). Lunch. After day 2, I had left overs from the night before I used for lunch. My go to meal was 3 ounces of grilled chicken with raw veggies and hummus if I didn’t have anything leftover. I also made veggie soup at the start of this cleanse which I used if I was still hungry or I used it as my afternoon snack. I’ll post the recipe at the end. Dinner consisted of a lean protein and usually 2-3 different veggies. A late night (9pm) snack of chicken or turkey and whatever fruit I had in the house. On days 1-7 Herbal cleanse pills just before bed with 2 glasses of water. In bed by 11pm so I could get 8 hours of sleep. Oh and you should do some exercise, I’m still working out when I can squeeze getting to the gym in, but I managed to go a few times these past 10 days. A little humor on this subject is needed. Source. So, Just How Bad Is The “Cleanse” Portion? Depends on who you ask. While both myself and my boyfriend occupied the bathroom on and off all day, he would say he was going just fine while I would whine that body parts were sore after a while. You’re gonna go. You may go all day. Around Day 3, I left the house to go to the gym and had to double back just to use the bathroom again. You will be clean. Perhaps not explosive colonoscopy prep type of cleaning, but you will be amazed on how much you’ve been storing all these years if you’ve never did a cleanse before. It got better after Day 5 for me after my diet regulated and all the bad stuff had left my system. By Day 7, I was back to my regular schedule even though I had taken the pills the night before. Looking back, it really wasn’t that bad and I’d do it again if I have to. Grilled Chicken with Roasted Veggie and Hummus Stacks (shown above). The veggies were so good I made this twice during the cleanse. I skipped adding the lemon to the hummus and I didn’t make my own hummus, I used store bought roasted garlic hummus instead. Grilled chicken was always a staple in my house anyway, so this was a delicious way to start the diet. Salmon with Grilled Asparagus, roasted carrot “fries” and grilled zucchini. I made little tin foil packs for the salmon with salt, pepper, garlic and lemon and baked in the oven at 400 degrees for 20 minutes, the asparagus I drizzled a bit of olive oil and salt and pepper and grilled with the zucchini. The carrot fries were shredded matchstick carrots in a bag tossed with red onions, olive oil and a bit of salt and pepper roasted in the oven while the fish baked. Sauteed shrimp (olive oil and garlic) over a cold spinach salad with red onions, dried cranberries and walnuts. (Easy on the cranberries and walnuts, just a sprinkle). The warm shrimp and oil with just a touch of balsamic was all you need to dress this salad. Turkey Stuffed Cabbage. Ground turkey, diced carrots, diced onions, a egg, salt, pepper, garlic, onion, 1/4 cup of oatmeal (in the blender to make a flour instead of breadcrumbs), 1/4 cup of brown rice. Mix like meatballs, stuff 10 cabbage leaves, cook in a can of diced tomatoes with a handful of raisins (for the sweet and tangy flavor stuffed cabbage was meant to have). There’s actually 5 servings here. Balsamic Chicken with mushrooms with a side of sauteed spinach. Season the chicken, add a tablespoon of olive oil and fresh garlic, brown the chicken on both sides, add the mushrooms and cook for a few minutes, add 1/4 cup of balsamic and a cup of low sodium organic chicken broth, cover and cook for 10 minutes. Saute the spinach with a bit of garlic, olive oil and a 1/2 cup of chicken broth. Turkey Fajita Lettuce Wraps. Brown the ground turkey like you’d make taco meat add taco seasoning and water to make it brothy, grill onions and peppers. Wrap in lettuce leaves with cilantro and salsa. Chicken Sausage with Broccoli. I grilled organic chicken sausage and served it with a side of broccoli sauteed with olive oil and garlic. Salmon with Cucumber Salad. I like salmon so this made it into rotation twice. I chopped a cucumber up, diced some grape tomatoes, sliced some red onions, added fresh minced garlic, chopped cilantro and tossed with juice from a lime a tablespoon of olive oil and a touch of salt. I let the salad sit for an hour or so before I served it so it was “juicy”. Veggie Burgers with Zucchini “fries”. Slice the zucchini into fries, roast in the over with a touch of salt, pepper and a smidgen of olive oil. Don’t use too much olive oil or the zucchini will get over oily – you want nice browned zucchini not greasy soggy fries. Place all ingredients into a large stock pot, add your can of tomatoes, broth, water and seasonings. Give it a stir. Cover, bring to a boil. Reduce heat to low, let it simmer partly covered for about 10 minutes. Easy peasy and your done. 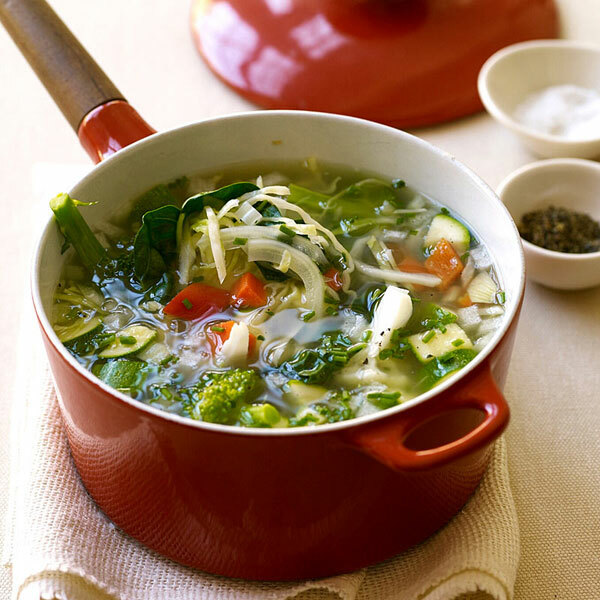 After the 10 day cleanse you can top off your bowl of soup with a bit of Parmesan cheese – stir it in and it is delicious. Very filling and this recipe will make so much soup you’ll be freezing alot of it. The original WW recipe calls for broccoli, cauliflower and swiss chard – three things I am not a fan of. However, you can add any veggies that you’d like to this. Note, your results on this program may vary. I was not paid by Advocare to write this review. Advocare is not a sponsor for this post. I am not a diet or healthcare professional, please consult your doctor for any dieting advice. I am not an Advocare distributor. If you are interested in Advocare, you may contact my coach (former personal trainer and friend for 6+ years), Jodi at Advocare or her own personal website, GetFlexAppeal.com – She has neither paid or sponsored this post (I’m just pimping her because she’s my motivation!) This post was just my review of how Days 1-10 of the Advocare 24 Day Challenge worked for me. Stay tuned for the second half of my review of the Advocare 24 day challenge at the end of this month. I love this post! The recipes sound great! Did you complete days 11-24?